Airports are loud, bright, busy places where no-one and nothing stands still. Of all these beasts, the ever-improving, ever-expanding London Heathrow was, until last year, the busiest in the world. 24-hours a day, sombreros, flip flops and tanned limbs jostle with skis, puffer jackets and woolly hats. Ibiza party-goers gulp pints of lager at dawn in the ‘olde English pub’ style drinking holes, honeymooners sample bubbles and caviar perched atop the chrome stools around the minimalist shiny glass bar at the pretentious but delicious seafood stand. Babies in the wrong time zone scream while harassed parents with ruffled hair and a dazed look trail battered suitcases and pushchairs piled with cuddly toys, Louis Vuitton matching luggage gets wheeled across the concourse on a trolley while its owner teeters through Duty Free in the highest stilettos and ‘Jackie O’ style designer shades en route to the executive lounge. Heathrow’s terminals have borne witness to heart-wrenching goodbyes, obscene mementos brought back from far-off tourist traps that never look quite the same when they get back home, unbridled screaming matches between tired travellers in a multitude of languages, tearful reunions and joyous departures to long-awaited sun-drenched destinations. So it is sad to watch one of these behemoths be put to bed. Terminal 1 has just days before it is closed down. And demolished. It’s making way for further expansion and no doubt more caviar stands in the gleamingly new Terminal 2. It apparently has aspirations to match the retail and hospitality experience that is currently Heathrow’s T5. 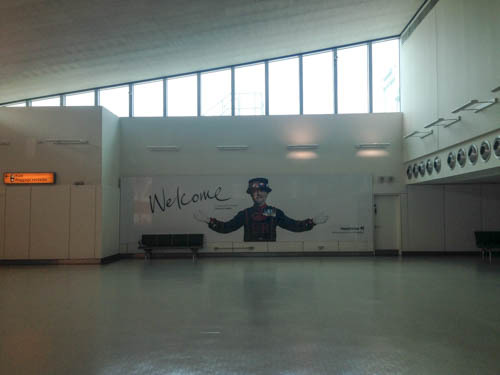 I can’t say I blame it – I’ve on occasion almost missed my flight I’ve been so busy enjoying the trappings of the British Airways hub and dancing across its vast shiny hangar-sized concourses. Which terminal wouldn’t want to be T5? In fact, I have become so familiar and attached to my T5 ‘experience’ that on a recent trip to Jordan, I turned up there on automatic pilot assuming my British Airways flight was there waiting for me. It was news to me that some (or just that one, I think) BA flights still depart from Terminal 1. So that was how I came to see the old lady in her final days. After a mad dash on the transit shuttle, we emerged from a lift into a dark and unoccupied check-in hall. I thought we had accidentally been ferried into a parallel universe like the ones in films where everyone has disappeared and the protagonist is alone on the planet running around in the deserted school corridors and shopping malls of his life. I might even have seen some tumbleweed but I can’t be sure. 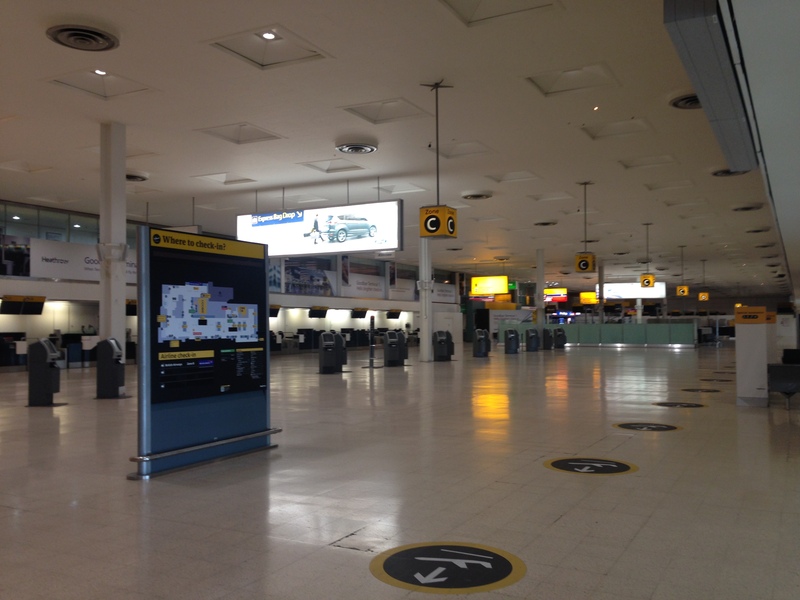 Terminal 1 Check-in hall – where is everyone?? I self-consciously walked across the huge hall up to a line of unmanned check-in desks, almost walking on my tip-toes to try and dampen the single echoing sound of my flip flops slapping the floor. One lady in a stretched and faded British Airways navy blue uniform (the new crisp tailored ones must be reserved for the high-flyers in T5 – excuse the pun) had been left behind by the invading aliens, ostensibly to provide a semblance of normality. She smiled and was cheerful, over-compensating I thought, for the deathly quiet, or perhaps just relieved to be getting the chance to speak to another human-being during her shift. I almost asked her what she had done to deserve to be sent to what seemed to be Heathrow Airport’s most remote outpost but decided it would be mean to rub it in. Security and passport control went by so quickly I almost felt guilty for not giving them more to search through after they’d gone to the trouble of turning on their machines and lining up the plastic trays for me to choose from. By the time we returned to Terminal 1 two weeks later, I really did think our captain had parked his aircraft in the wrong place. First off the plane, we strode down dark corridors. The life-size Beefeater and London Taxi driver welcoming us into the UK from the billboards were left waving at nobody in particular. I almost walked straight through passport control, barely noticing the diminutive Customs and Excise lady nodding off at her terminal. The whole place looked like closing time in a shop, where the tills have been totted up, they’d rather you didn’t buy anything thank you and could you please just go home. We followed the half-lit yellow signs underground to the baggage collection area to find silent carousels stationary and all signs showing an apologetic “Reclaim Closed”. As I typed texts into my phone absent-mindedly, a sign flashed up suddenly announcing “Reclaim 1” for my flight from Amman. But like a ghost house in a movie, reclaim 2 behind me whirred into action inexplicably, with a steady thump thump thump of rubber catching on the worn rivets in the mechanism. No sooner was my suitcase catapulted onto the deck, and I was out of the “Nothing to Declare” channel in a shot, seeking daylight and normality, and to reassure myself that the world had not ended during my time within the grey walls of Terminal 1. London Heathrow’s Terminal 1 will close at 21:15 on 29th June this year. It has served us for almost fifty years, starting out as the biggest short-haul terminal of its kind in Western Europe. Opened by Queen Elizabeth in 1969, it is somehow fitting that it should be replaced by the recently opened and now expanding Terminal 2, the ‘Queen’s Terminal’. We’ve all met her, she’s that waitress or shop assistant who behaves as if she’s doing you a favour to even acknowledge your presence, despite the fact that she’s employed to serve customers. I did my time behind a fast food counter as a teenager, suffered the indignity of the candy cane uniform on minimum wage as an usherette at a theatre when I was slogging it out as a professional dancer, and graduated to silver service waitressing at black tie events to make a bit of extra cash during my law studies. I had my share of rude and condescending idiots, of gropers, and of people who simply wandered through me as if I was invisible or simply too lowly to acknowledge. Throughout, I gritted my teeth, maintained a polite tone and a smile and stuck to the motto “the customer is always right”. Almost always. Just once, someone went too far and the gentleman in question found himself wearing the bowl of soup he had ordered. I had tripped, obviously, so I apologised profusely and offered to pay for the dry cleaning (on behalf of the pizza restaurant I was working for) over the cheers and guffaws of my waitressing colleagues. So I am very sympathetic to staff in retail and hospitality who work long and tiring hours, get paid peanuts and often get little thanks for what they do. As a result, I always go out of my way to be a polite, friendly and patient customer. Seriously, you would have to wipe my food on the floor or visibly spit in my soup for me to dream of complaining to the chef or the management. I had some time to kill in between meetings near Sloane Square in London so decided to select a café where I could sit quietly on my laptop with a cup of tea. The outside was, as you’d expect in this area, expensively welcoming; the name of the café scribbled in trendy handwriting across a plush awning suitably shielding would-be patrons from the torrential rain, while they perused the menu displayed in a glass case by the door. It had an area laid out with floor-length crisp white tablecloths for serious diners but also an alcove where coffee and snacks were the order of the day. Perfect. Or at least it would have been if the young Sloane in the apron with a notepad and pen in her hand had had any intention of prising herself away from the stubbly Mediterranean beefcake manning the bar to take an order. I soon realised there were already three people seated in the alcove, on a sliding scale of frustration from mild annoyance to about-to-throw-cutlery-at-her, waving for her attention. Every now and then in between gazing into Eye Candy’s face and giggling coyly, she would do a scan of the room as if checking for new customers or tables to clear. She managed that aloof middle-distance stare that pointedly avoids eye contact with anyone and remained blind to the ever-more frantic gesticulating of the businessman in dire need of his morning espresso and the painfully elegant couple on their way back from the gym looking to refuel on one of the green kale and edamame bean-based smoothies on offer. A full 20 minutes later, the delicate velour stools scraped unceremoniously across the floor and their occupants stormed out of the café loudly complaining about the lack of service. The Entitled One was buffing her nails on her apron and barely noticed. Having caught her eye three times without so much as a kettle being boiled, I decided on a different approach and was determined not to give up. I wandered up to Eye Candy who was drying glasses behind the bar, apologised for disturbing him and asked innocently if there was anyone actually serving the tables in the cafe area (the undeniable decorative value of the Entitled One notwithstanding) and would it be possible please to have a pot of tea (sometime before Christmas). Eye Candy shot a dark accusing look at the Entitled One, before turning back to me and apologising, oozing charm and a thick Italian accent. With an unnecessary flourish of his tanned arms, he had a pot of tea and plate of macaroons (the latest in biscuit trends) set out for me before I could get back to my velour stool and sit down. The nail buffing stopped abruptly and the Entitled One’s vacant eyes darkened as a petulant scowl spread across her pretty face. With more energy and purpose than I had seen her display since I had walked in, she marched over and announced “actually that’s the job I am supposed to be doing” and stood there looking pleased with herself. I am not sure what she was expecting me to say and I didn’t have the heart to come out with the numerous sarcastic comments I had on the tip of my tongue (most inspired by Julia Roberts’ killer lines to the shop assistants on Rodeo Drive in the film Pretty Woman). Well, at least behind the vacant superior look, she knew what she was supposed to be doing, even if she wasn’t quite prepared to do it just yet. I hoped for her sake she’d realise before too long that the more pride she took in her job and the harder she worked, the more likely she was to get the respect to which she so clearly thought she was entitled. Otherwise she’d be left with highly buffed nails, a well-sculpted mask of disdain and her unused notebook, wondering why the rest of us were ignoring her as we got on with our lives with a please, a thank you, and a plateful of macaroons. It felt as if the cheeks of my backside were bumping against the backs of my knees, as if my post-Christmas muffin top had not quite set and would pour over the elasticated waistband of my running leggings, but I did it. I went out for my first run of 2015. I say run; it was really more of a shuffle or a ‘joggette’. To be fair, it was my first bit of real exertion in a while. The chest infection and hacking cough that had been hanging on since early December were still lurking in my lungs on the uphills, threatening to explode messily and alarm passing dog-walkers. The neck and shoulder muscles that have set like concrete after years of extreme activities started screaming after just a few miles (who am I kidding – a few metres), and the large piece of Christmas cake I had hoovered down earlier in the afternoon almost made a colourful reappearance due to the excess of effort. Now the trick is not to allow myself to feel disproportionately virtuous for my small trot around the block and justify rewarding myself with a large amount of snacks or wine. I cannot keep wearing the same pair of (baggy) jeans forever – they will eventually leave home of their own accord if I do not wash them – and one of these days the cold weather will be pushed out by a glorious summer (I am trying to think positive) and I will have to peel off the clothing currently camouflaging my hibernation layers. So when I am tempted by steak and chips with a nice glass (or three) of Rioja, a cream pasta with yet more red wine, or a gluttonous portion of Nandos chicken, I will remind myself that even though I don’t do New Year’s resolutions, what I will call my 2015 ‘reboot’ of that relatively healthy lifestyle I used to have, must continue. I tell myself that as I get back into it, I will start to enjoy my runs around the local countryside, sucking up the vitamin D as the days get longer and stretch into balmy sunlit evenings, silently scoring the immaculately English country gardens as I pass their green-fingered owners pruning and trimming the spring flowers, and slowing to quietly observe the families of deer foraging in the woods. I tell myself that at the gym, I will be able to enjoy the smug feeling of still being there punching and whooping my way through Body Attack classes when the New-Year-resolution-joiners of 2015 have long lost interest and torn up their membership. But most of all, I tell myself that as I get back into it, I will start to feel the cheeks of my backside returning to their rightful position, the muffin top melt away and my breathing calm to a more dignified wheeze. I will then genuinely be entitled to that steak and chips, that glass of wine (or three), and the leftover Christmas cake that I have yet to hoover up. First published 12th Nov 2007 on Ministry of Defence website. As Armed Forces personnel around the world were preparing to remember their fallen comrades on Remembrance Sunday, soldiers from the 2nd Battalion Royal Welsh were out on patrol in Basra Province looking for ways to help local people prepare for the winter. C Company deployed to the Al Qurna district in the north of Basra Province, visiting projects set up by the British Army in neighbouring villages. The convoy carried a JCB digger, which was used to dig irrigation ditches for date palm plantations in one village and excavate land for a new school in a neighbouring settlement. “We’ve come to the village and, following advice from the last time, we’ve brought a light-wheeled tractor. We’ve been digging some irrigation ditches so they can grow some cash crops and crops for feeding themselves. The 2 Royal Welsh soldiers endured a difficult first few months of their tour in Iraq. Having the opportunity to meet ordinary Iraqis and see the difference they have made to their living conditions and prospects gave the soldiers a considerable boost in morale as they near the end of their operational tour. 2 Royal Welsh returned to their base in time for their Remembrance Sunday memorial service. They were planning to remember, in particular, the three friends and colleagues they have lost during this operational tour. Having now seen the positive result their efforts have had on the ground, many of the men from 2 Royal Welsh will go home feeling the last six months’ sacrifices may not have been in vain.